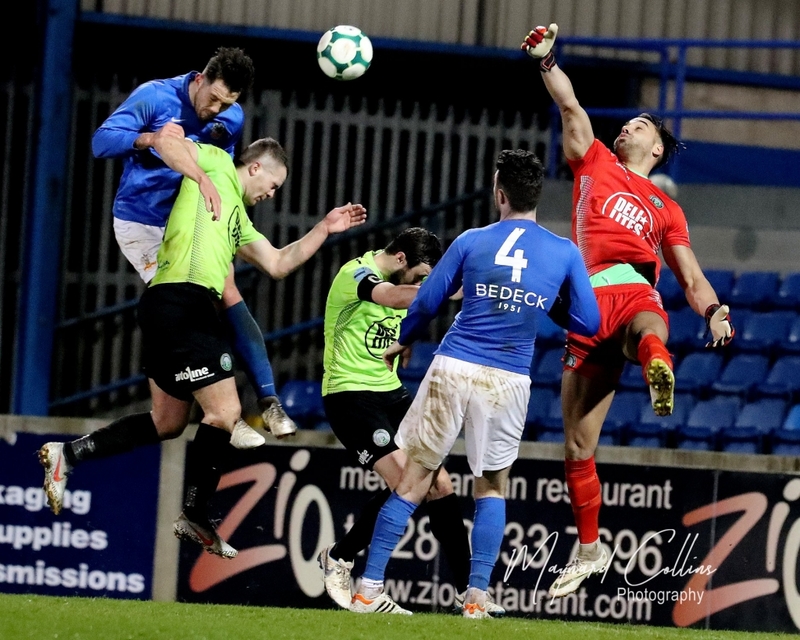 Glenavon defended their Mid-Ulster Cup title by coming from two goals behind to win a seven-goal thriller at Mourneview Park on Tuesday night, defeating Warrenpoint Town 4 – 3. Warrenpoint took an early two-goal lead through strikes from Ciaran O’Connor and Lee Duffy, but goals from Cameron Stewart and Conor McCloskey meant Glenavon went in level at the break. Seamus Sharkey headed in Sammy Clingan’s free-kick just after the hour mark to put the Lurgan Blues in front, only for Eamon Scannell to draw the Point level 15 minutes later. 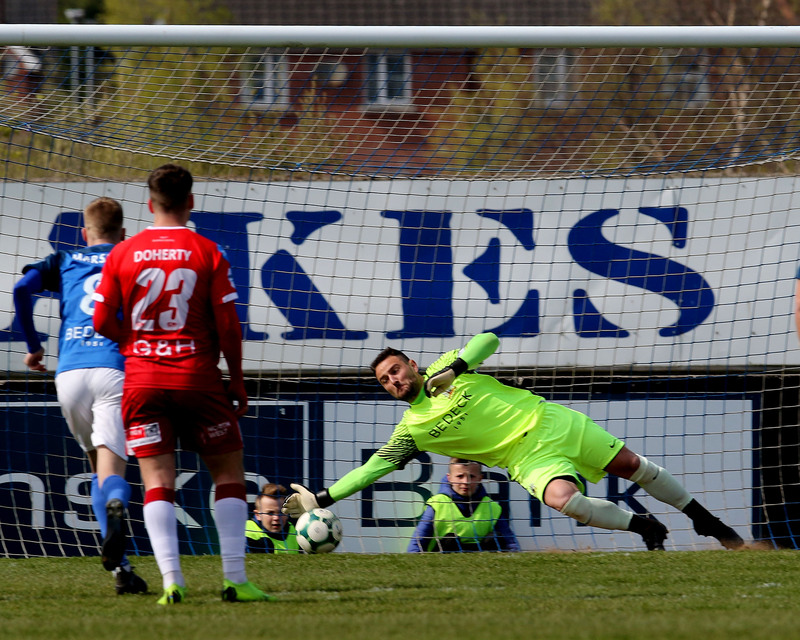 It was Sharkey who would have the final say, however, when he scored another header two minutes from time to ensure that the cup will remain at Mourneview Park for another season. 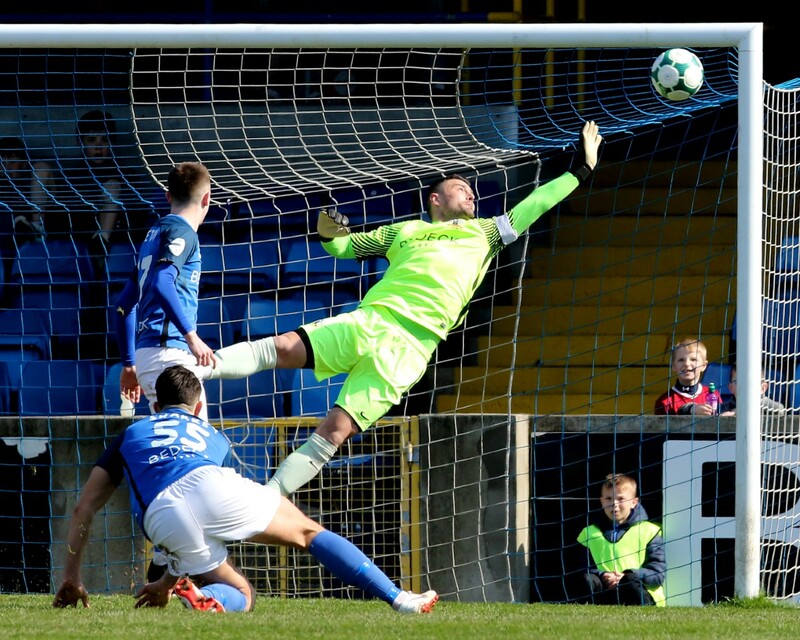 Warrenpoint nearly opened the scoring in the third minute of the match when some neat passing between Fra McCaffrey and Duffy created a shooting opportunity for the former, but Town’s captain side-footed his effort wide of James Taylor’s left-hand post. Four minutes later at the other end McCloskey’s well-struck shot from distance had to be tipped over the bar by Berraat Turker. Warrenpoint went in front less than a minute later. Taylor was caught dawdling on the ball by O’Connor, who had the simple task of rolling into an empty net after he’d dispossessed the goalkeeper. O’Connor might have doubled his tally on 10 minutes when McCaffrey pulled the ball back to him. The striker’s shot with the outside of his right foot went narrowly wide of the near post. Taylor made amends for his earlier error when he dived down to his right to save a fierce shot from Conall Young in the 12th minute. Glenavon strike partners Stewart and Stephen Murray combined two minutes later to fashion a shooting chance, but Murray’s tame effort was straight at Turker. 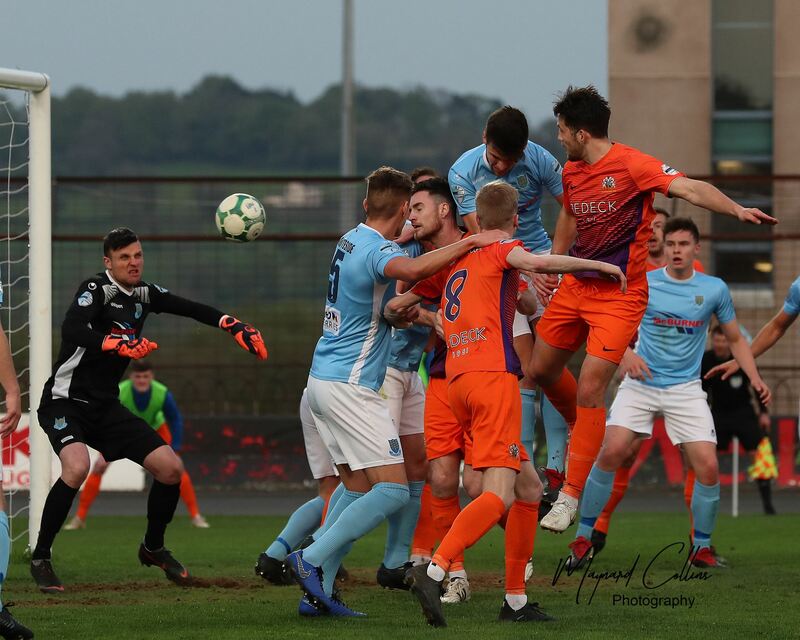 Duffy, who had a good game on the flanks for Warrenpoint, threatened the Glenavon goal on 15 minutes when he flashed a shot over the bar with his left foot. He then grabbed the second goal that the Point’s bright start to the game deserved two minutes later, cutting inside and hitting a low shot which deflected off the boot of Sharkey and found the net. A swift response from Glenavon was essential, and that’s exactly what Stewart gave them in the 20th minute. The big striker produced an excellent first touch to bring a high ball under control before firing a low shot past Turker and into the far bottom corner with his right foot. Ten minutes later the Lurgan Blues were level. Winger Conor McCloskey battled his way through a couple of Warrenpoint tackles before firing another low shot into the same corner which Stewart’s effort found. Both teams had opportunities to go in front before half-time. First of all Taylor made a decent save to deny O’Connor. Scannell latched on to the rebound but failed to hit the target. Then Murray went round Turker at the other end, but instead of shooting himself he opted to try and pick out Stewart instead and the chance was lost. Full-back Leighton Jamieson’s poor throw-in put Glenavon in trouble in the fourth minute of the second period, allowing O’Connor to break into the box and shoot, but Taylor did well once again to deny the forward. The Lurgan Blues went ahead for the first time in the match in the 62nd minute. Clingan’s free-kick from deep on the left flank picked out Sharkey and the defender’s header found the net via the post. Clingan was involved again three minutes later when player-manager Gary Hamilton picked him out on the edge of the box from a corner-kick, but the midfielder couldn’t direct his shot on target. Warrenpoint levelled the match in the 76th minute. O’Connor carried the ball to the byline before sending a low cross into the box. 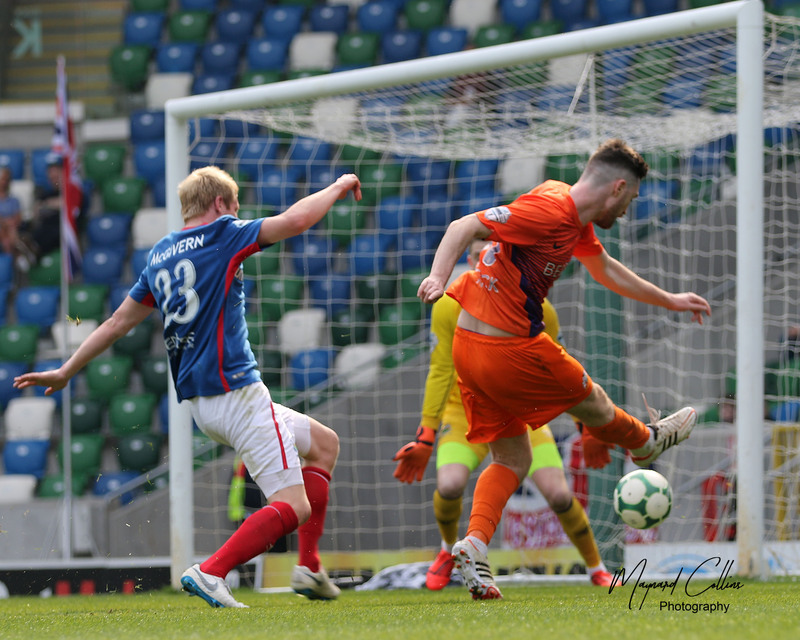 When Glenavon failed to clear the ball it fell for Scannell and he smashed a low shot into the net to make it 3 – 3. Town had their tails up at this point and they went in search of a winning goal. The dangerous O’Connor fired a shot narrowly over the bar just a minute after the equaliser went in, while McCaffrey fizzed a cross along the six-yard box five minutes from time. But it was Glenavon who found a winner in the 88th minute when Sharkey capped a man-of-the-match performance by grabbing his second goal. 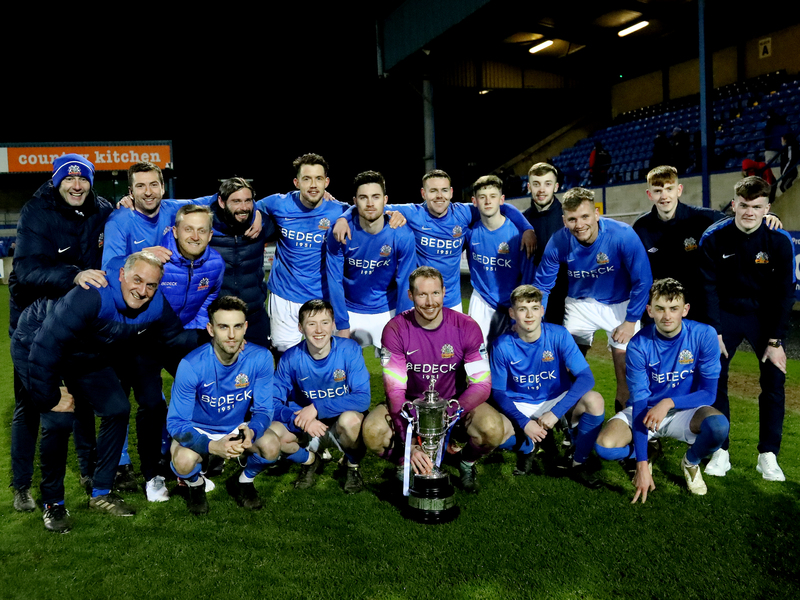 McCloskey sent a corner over from the right and Sharkey rose at the far post to head the ball down and into the net, ensuring Glenavon retained the Mid-Ulster Cup in the process. It’s back to Premiership action for the Lurgan Blues on Saturday (6th April) as they welcome third-placed Crusaders to Mourneview Park for the first post-split fixture (kick-off 3pm).